It was a beautiful Saturday morning and we wanted to take a hike as a family but wanted a little something different. 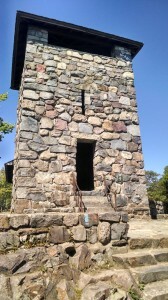 We decided to head on over to Blue Hills to hike up the mountain. We parked over by the trailside museum and started on the red dot trail. 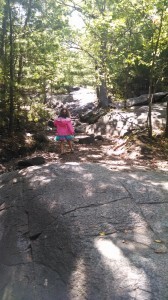 The trail was filled with lots of other children braving the mountain as well. My daughter was a champ. In sequenced sparkly shoes and a tutu dress, she scaled the rocks better than my husband and I. She excitedly ran ahead looking for the trees with the red dots and told us to follow her. Our tiny 7 lb dog fell next in line, following right behind my daughter, right on up the mountain. 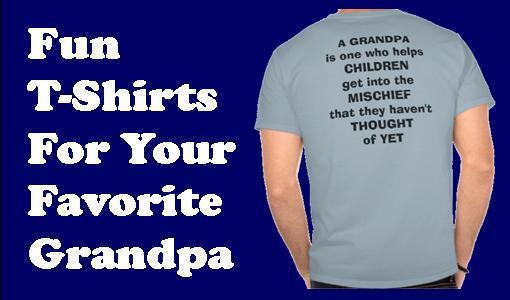 My son did not fare as well. I think the rocky terrain was just a bit too much for his little legs to handle so my husband hauled him up the mountain in his arms. The trail was packed with families and dogs. 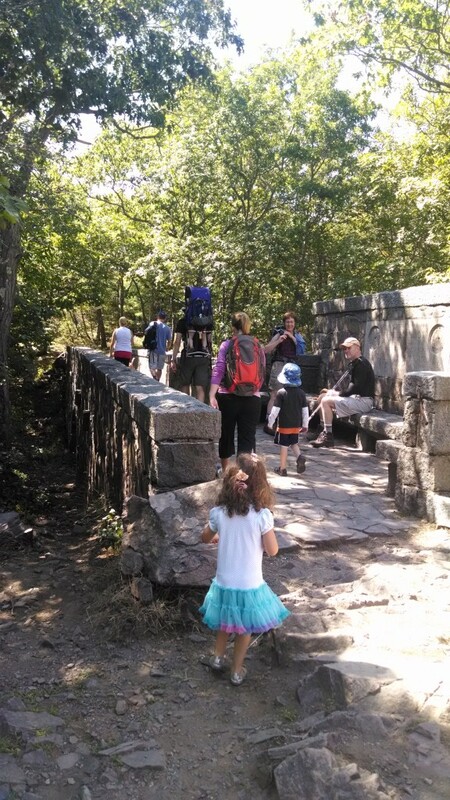 Many families (smarter than us) had hiking backpacks for the little ones while their older kids/toddlers had a blast climbing the rocks. 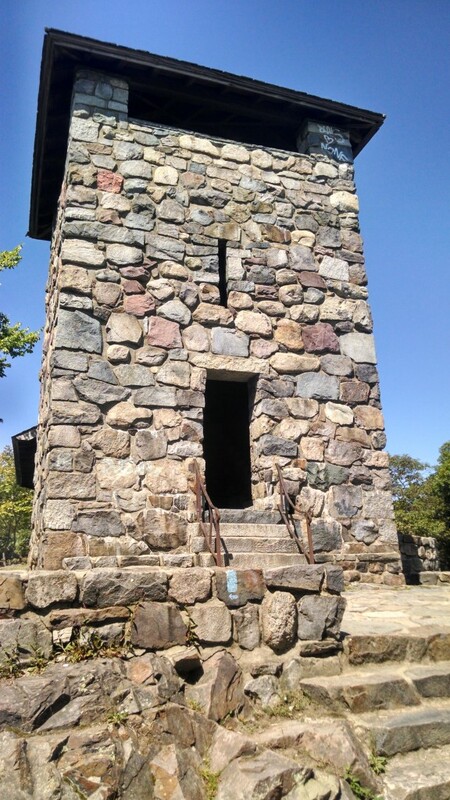 Once you get to the top of the rocky terrain, there is a tower made of stones and picnic area. My daughter thought that maybe she would find Rapunzel at the top but no such luck. 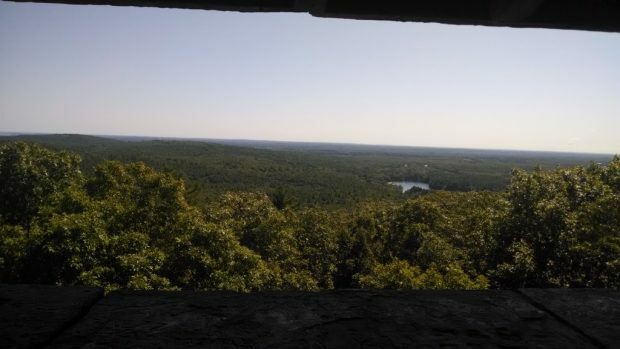 Regardless, it was fun to climb up and take in the view from the top of the tower. 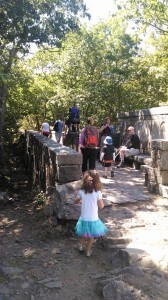 There’s also a bridge at the top of the mountain which my daughter thought was a blast to run across. We told her to save her strength because we all had to make it back down the mountain as well. Her little legs definitely were tired on the way back down but we all made it. There’s also a trailside museum at the bottom of the hill. They have animal meet and greets on the weekends and exhibits both inside and out. This was definitely a more strenuous hike than we typically do but a lot of fun to be able to reach a destination at the top.